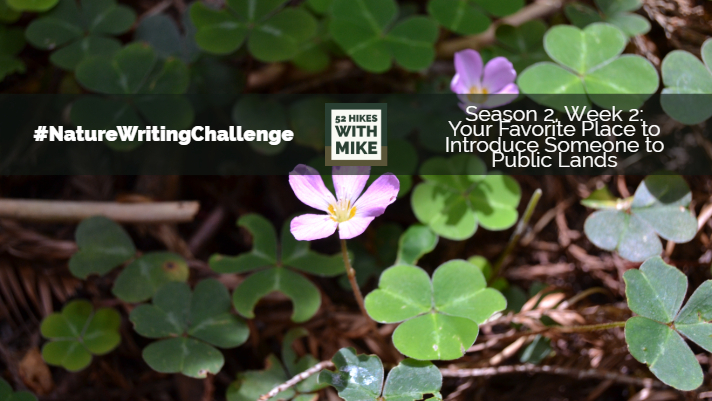 A memorable or favorite plant, large or small, found on public lands. At first thought, I wanted to write about the huge trees along the west coast that I love so much. 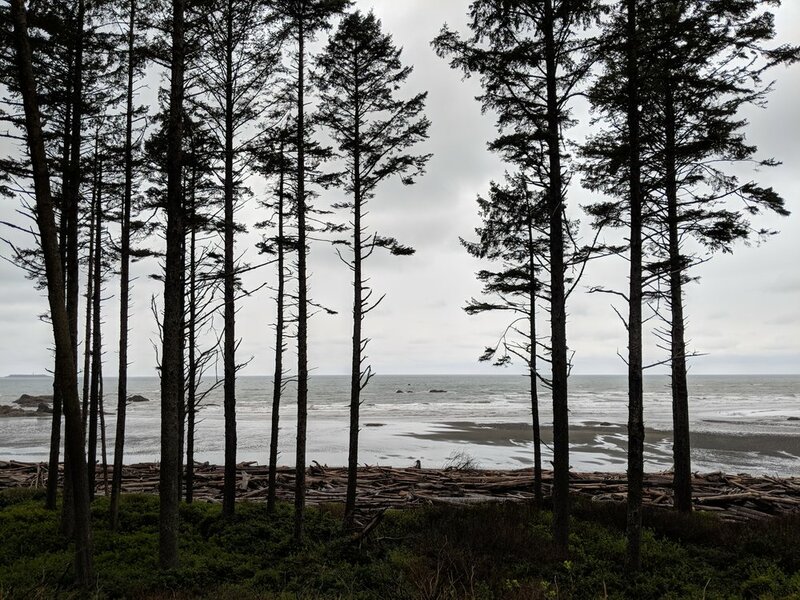 But, after a little more digging, I decided to focus on something that surprised me and really made me smile on one of my trips to (YES, You guessed it) the Olympic Peninsula. Western Skunk Cabbage, Lysichiton americanus, is a yellow flowering plant often found in the swamps of the moist northwestern forests. These yellow delights were a surprise for me, as I didn’t really plan ahead by reading about the plants of the Olympic Peninsula. By the time I laid eyes on one of these plants, I had already been hiking around for an entire day. I had seen some pretty pink flowers, a variety of trees and mosses, and several types of ferns. Expectations were met, and exceeded, with plant life. Little did I know what was coming - in the form of skunk cabbage. I started my trek out to the coast on the Ozette Triangle (Loop) trail and crossed the bridge. If you read last week, this is probably my favorite trail I’ve experienced on public lands. 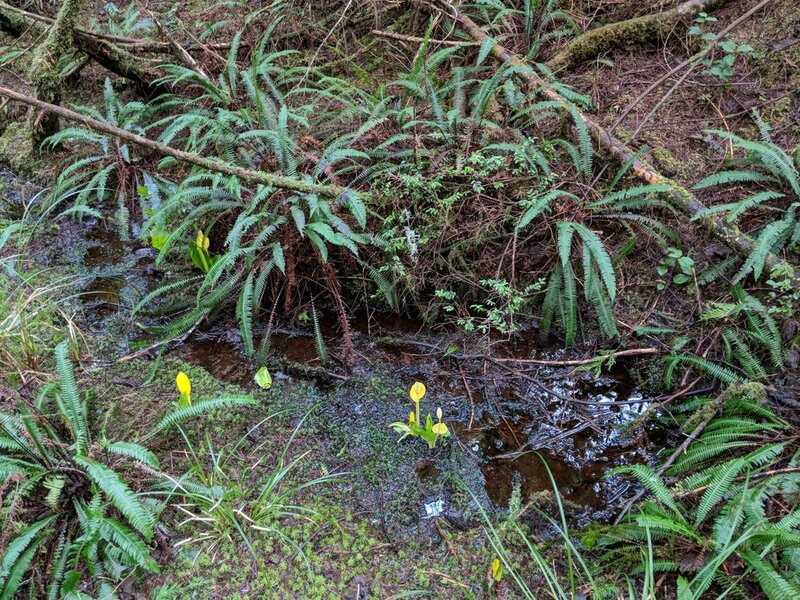 I wasn’t far along the trail, which was mostly a boardwalk, and I noticed these yellow “lily-looking” flowers in the swampy areas. I saw a few skunk cabbage plants and moved along, feeling pleased to see something new. Every little patch of swamp, I saw more and more. They were everywhere! The yellow flower was the perfect compliment to the varying hues of green in the forest and a stark contrast to the black mud and tannin rich water. I walked on, made it to the coast, and then saw more of them on my way back to the parking lot. I made a Twitter post once back at my motel for the night and I’m pretty sure @Publiclandlvr was the one to clarify what it was for me. I had one more day on the peninsula, and it was suggest that I visit the Quinault region. I went on the south side, through the little tourist area and then made my way to east end around the lake. I saw beautiful trees and moss, some new trees, and a few more flowers. I decided to take a walk on the Maple Glade Rain Forest Trail. I’m so glad I did, because the water flowing through the swamp and the moss covered broadleaf (leafless) maples was stunning on that misty, foggy day. 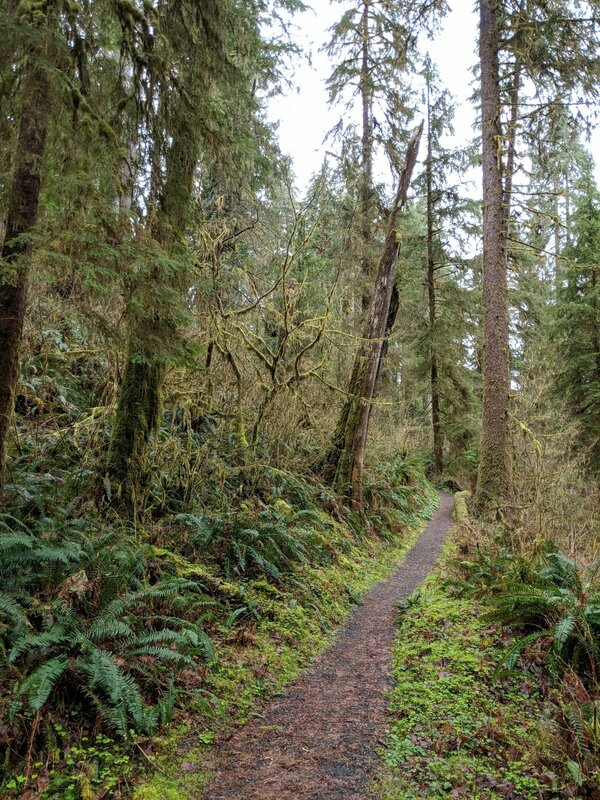 I did the small loop, already elated at the first sound only to be energized even more seeing the beautiful dots of skunk cabbage among the most brilliant green plants I’ve EVER seen in person. The pictures from that day DO do it justice, because you can see the gorgeous yellow dots and the brilliancy that is the green. What a treat. Skunk cabbage apparently has an odor, to attract certain pollinators, but I didn’t smell it. Maybe I was high on the ocean air or the misty rain forest smells, but it didn’t hit me. I know the hearty yellow flower isn’t the most IMPRESSIVE plan on public lands, by any means, but it sure is a delight among the rest and something that I have fond memories of seeing for the first time last year on my first real hiking trip to Olympic National Park. I enjoyed every plant I saw on my trip, but I’ll always be excited to visit in the spring and look for good ole skunk cabbage. It was the final day of my long weekend in the Pacific Northwest. I had hiked the Ozette Triangle, visited Mt. Storm King and wanted a little more Olympic National Park before heading to my flight in Seattle. 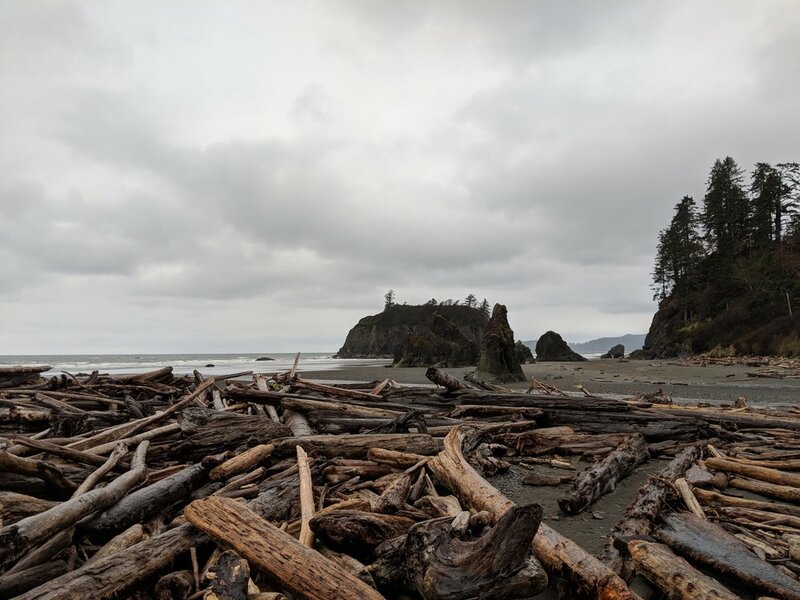 I had spent Saturday night in Forks, after visiting Rialto Beach and spending time in the Hoh area so it was a great starting off point for this rainy day ahead. I put on my rain coat, checked out of the motel, and headed towards Ruby Beach. The rain was off and on, but when I got to the beach trail it was ON. It was sideways rain, but I was determined to enjoy Ruby Beach. I had visited Ruby Beach years before, and needed to revisit it. I was glad to see that you still have to climb over tons of fallen trees to get to the beach. It was gray and wet and completely perfect. From Ruby Beach, I went to the Kalaloch Lodge to grab breakfast. I had breakfast with a view of the ocean, the gray sky, and a bloody mary. It wasn’t very busy and I felt quite relaxed between my stops for the day. From the lodge, I made my way out to the Quinault area. I did a little hike just past the lodge, on the Wrights Canyon trail, in kind of a misty haze. I didn’t go very far before turning around, just so I knew I had enough time to see everything I wanted to see. From that trailhead, I moved east around the lake. I stopped to take an obligatory photo with Bunch Falls and continued on to the Maple Glade trail which was one of the highlights of the entire weekend. The forest was the greenest green and the rain was light but prevalent with added drops that collected in the canopy. The skunk cabbage was prominent, the water was flowing, and the trail was magical. From Maple Glade, I finished the trek along the north side of Lake Quinault and back to the main road. The rain was picking back up, and the drive back towards Seattle was hit or miss with showers. I stopped at a rest area with the biggest trees I’d ever seen at a rest stop, it downpoured, and I continued onward to the REI downtown. The Pacific Northwest is my favorite place to be no matter the weather. Rain is expected, and every time I’ve visited I’ve been ready for it. I went in the spring and I got spring. The weather was cool, wet, windy, and completely perfect. I’d take a rainy day in Washington over a sunny day in Texas any day of the week. Of all the road trips, camping trips, and vacations, I’d have to say seeing public lands became a big part of them in 2008. My best friend Kevin, the guy from all of my road trip stories, really inspired my love for and promoted public lands the most out of anyone I knew back then. We started to incorporate visiting public lands in our road trips and eventually made it our mission to make various National Parks our main destination. Today, we don’t get out as much together as we did back in college, but I think we both still love public lands and what they stand for as much or more than before. Our last big trip before both of us settled into life was leaving Houston on a whim and driving to Saguaro National Park just to see it really quickly because we had to be back the next day. The thrill of the road trip plus a destination to see cool cacti was all we needed. Since then, I know he’s taken his family on a couple of trips that included various National Parks and public lands to which they all seem to have enjoyed. I’ve taken trips since then to visit many National Forests, Parks, and Monuments. I live for it now, and it’s easy to say it started back with a simple road trip in 2008 that included Redwood National & State Parks as well as Death Valley. 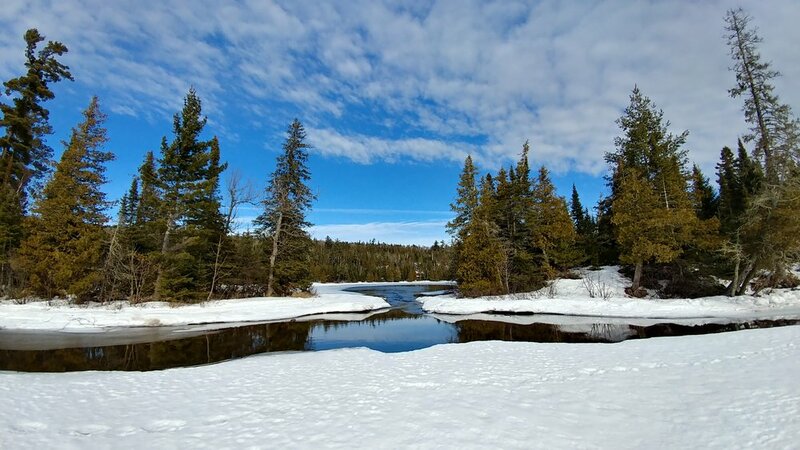 We are lucky, and when possible, can travel together to his family cabin in Northern Minnesota which is surrounded by National Forests and the Boundary Waters Canoe Area Wilderness. Northern Minnesota is a REAL TREAT and if you get the chance, get up there and experience that solitude and untouched beauty. It’s one thing to sit and read about the land set aside for us, but visiting various places and putting it all together makes it truly sink in. My buddy Kevin may have encouraged and inspired my initial love for public lands, but it is the online outdoor community that inspired my desire to continue to protect, expand, and care for them. One beautiful thing about the internet and social networking is the ability to connect with people to share knowledge and promote an end game that we can all get behind. I am forever grateful for the online outdoor community, some of whom I get to meet in person, for our shared love of all things public lands. I’ve never had to think too hard about which piece of public land was my favorite to introduce to someone because I’m usually just so glad someone wants to go at all. My experience with public lands beyond state parks isn’t much, and I don’t know many people that are too adventurous, but I’m always willing to go anywhere anyone is up for visiting. I’ve had the joy of showing my other half Arches and then showing it to my best friend five years later. My friend Kevin and I have taken friends to Death Valley and seeing other people enjoy it as much as we did was wonderful. But, nothing has made me more excited than showing my best friend and other half Redwood National and State Parks in California. 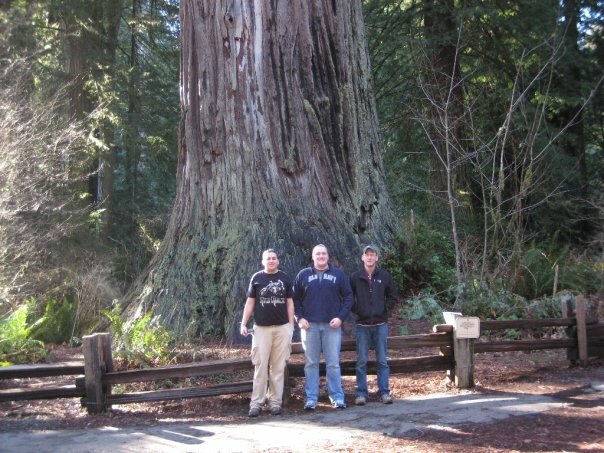 I originally visited the majestic Redwoods in spring of 2008 and long to go back as often as possible. Each visit to the Redwoods, be it a state or national park, has been absolutely magical. From our first drive through in 2008 to my the most recent in 2017, which I’ve discussed [here], [here], [here], and [here]. I love the Redwoods, and with limited exposure to public lands thus far, I’d say it’s in my top three for favorite destinations. But, this isn’t about that. I’m excited just thinking about taking people to the Redwoods for the first time. Many people have heard of the big trees on the west coast, but few that I know have actually visited them. Expectations for what they look like are set from textbooks or internet photos, but seeing them in person usually blows them out of the water. Redwood National and State Parks cover a LOT of ground. I’m talking, hours of driving and days of hiking to see it all. So, I can’t say that I’m an expert or that I’ve even visited every special place, but that makes it even more amazing to revisit. I’ve been to several of the main places, and that’s usually how it started when introducing my BFF and other half to the vastness that is the Redwoods. We’d hit up a popular spot and do the drive through the Avenue of the Giants. Each time, though, we’d try something else. From the Big Tree area we ventured off into the woods or from near Prairie Creek we headed over to Lost Man Creek. I’ve hiked the same trail, 9 years apart, but didn’t even know it so it felt brand new to me. There is more to the Redwoods than just the big trees and ferns. There are wild rivers running through, old dirt roads that take the long way, and so many smaller trees that are just as beautiful. There are plenty of tourist attractions and a few gift shops as well as several small towns with stores and restaurants. One can feel very small and alone or completely part of the tourist crowd, it’s a choice that can even mean having the best of both worlds. If you can get to Northern California, go to the Redwoods. Go on a weekday, go on a weekend, go for several days. Just. Go. You will likely not regret it unless you HATE trees, endless green leaves, ferns, dampness, fog, or the freshest smells of your life. "A moment when you felt small compared to the grandeur of our public lands"
The year was 2008. Two of my best friends and I had set out on a spring break road trip based on the success of our first one in 2007. We were almost done with college and wanting to see a little bit more of the country before it was too late and we had full-time jobs. Road trips in 2008 involved using a laptop in the backseat to navigate with a Microsoft Streets & Trips GPS attachment stuck to the window. Road trips in 2008 were in a rental car because none of our cars would make it more than six hours before blowing something. We set out, headed from Grand Rapids, MI to the west coast, with a few minor stops along the way. This trip was designed and planned to maximize our stops along the route; the previous year we unintentionally avoided too many natural wonders and tourist stops because we just didn't have a plan. The trip had many "first experiences" such as the first time seeing the Pacific Ocean, a city as big as Seattle, the Redwood trees, San Francisco, sequoia trees, Death Valley, Las Vegas, and St. Louis. Pike Place Market was an enriching experience, the Oregon coast was breathtaking, Las Vegas glittered, but the redwoods were shockingly beautiful. I had seen photos, read books, and researched them, but I had absolutely no idea the emotional impact they would have on me when I wrapped my arms around one and stared up the trunk. As cliche as it may sound, the Redwoods made me feel small in the best way. I can vividly remember leaping out of the car and running over to a redwood along the road and just standing there in shock as I tried to wrap my head around the size of that tree. The trees of the Oregon Coast were gorgeous, wild, and large in scale to some we had in Michigan but fell out of memory once I saw the vast beauty of a mighty redwood. We walked to the "Big Tree" and took photos, as tourists do, and stood in awe. We drove through the Avenue of the Giants, stopped at a few trails and shops, and were on our way in just a few hours. 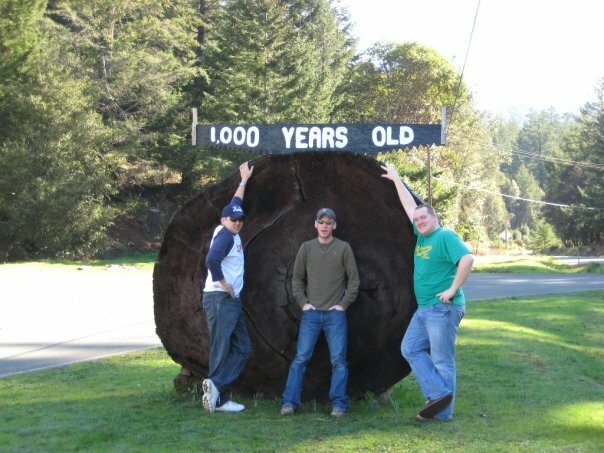 We did the classic "drive through a tree" Redwoods activity and posed in front of a 1000 year old log. For those few hours, I forgot about the spats we had in the car for days prior, forgot my responsibilities, forgot where I was from, and I became fully present. For the first time in my life, I felt small but so alive at the same time. These trees are some of the largest living organisms on the planet and we get the luxury of walking through their forest home and breathing their fresh air. I've had the privilege to visit the Redwoods several times since 2008 and every time feels a bit like the first time. I still feel small and alive, I'm still swept away from reality, and I'm still in shock of how these trees can exist. Lost Man Creek is one of those spots I didn't plan on visiting but was instantly grateful for finding when exploring Redwood National and State Parks. 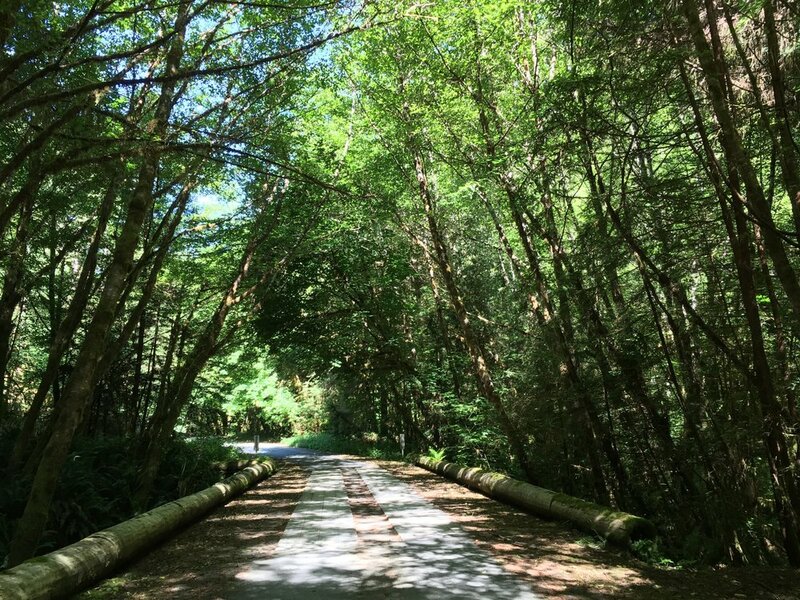 I was traveling with my other half, a summer road trip to see the Redwoods, and we did not have a lot of plans set in stone other than our hotel in Arcata, California. The plan was to venture south one day, to see the sights around the Avenue of the Giants and then a couple of days north with no destinations in mind. One morning after coffee, the car was pointed north on the 101 and the exploring began. First stop was the Prairie Creek Visitor Center area to make a plan. We checked our Google Maps, searched for places online, and Lost Man Creek came up. We had nothing to lose, so we went. Following the signs, we turned down the road that led to the parking lot. The road was narrow, dirt, and flanked by moss-covered trees. The parking lot was empty, which was a nice surprise, so we parked and headed toward the moss-covered picnic table. I can’t recall if there was a sign that had a functional map, but we followed what appeared to be an old road along the Lost Man Creek into the woods. First things first, we posed with several large trees because that’s what you do in the Redwoods. After the photos, we admired how quiet it was in regards to the outside world. It was far enough from the 101, or there were enough trees, that it seemed like it was in the middle of nowhere. I can remember just standing in a patch of sunlight coming in through mossy branches and listening to the creek trickle by. We went back, further and further, finding more solitude as we walked. With the solitude came endless ferns, a few white iris flowers, and honeysuckle. The ground was a brilliant green as far as you could see, with the creek barely visible along the trail. This creek in this park, at this moment in time, holds a significance to me because it was a moment of complete freedom. It was relaxing yet fun, an easy hike yet beautiful, and accessible without the crowds. The time spent along Lost Man Creek was an ideal moment on public lands. To this day, I have wallpapers on my work PC of this specific place to remind me to calm down, take a moment, and find some peace when things get stressful. I can’t wait to get back, hike a bit further, and enjoy it all over again in a new way someday. **Editing done after the hour due to technical issues.